Although I could find some online articles about traveling with cats, their advice was too general to really help me. What I needed was specific information. I wanted advice on which type of carrier worked best for the ride. I would also need to transport the cats to a pet-friendly hotel room on the overnight stays. It took a lot of searching through various advice pages, and reading Amazon reviews of cat products, to finally decide what I would try. Some items I bought were returned, and some worked out very well. I'll share my first hand experience here for those of you planning a similar excursion. All in all, the 3-day trip went better than expected, and the cats settled down and accepted their circumstances after the first few hours. By the second day, they were quiet the whole day. How to plan a long road trip with two cats. What are your cats' special needs? And can you help them be comfortable in the car? I have two black cats named Fontana (13lbs.) and Skittle (10lbs). Once I realized I would need to move back to Florida, my biggest concern was how to move my cats comfortably. I had traveled with dogs before, but never with a cat. Fontana meows constantly on the 20 minute ride to the vet, and Skittle tends to get car sick on any short trip. Now I had to deal with taking two of them with me, in the back of my Subaru Forester, while I drove 1400 miles down the eastern seaboard! Along with selling the house and moving, it was an additional stress I really didn't need. To overcome my anxiety, I decided to be well prepared far in advance of the trip and it paid off. We all spent three long days together, but made it to Florida just fine! Day 2 of the drive to Florida from New Hampshire. Fontana on far left, and Skittle. They didn't love it, but they did fine. 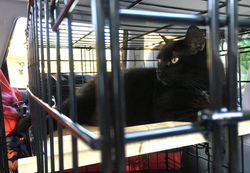 The Best Cat Cage For Long Distance Traveling - is meant for dogs. I bought two of these cages, one for each cat. They are sturdy and provided a comfortable ride for my babies. I'll jump to the end of the story first, in case you just want to get on with it. After researching and purchasing some things I didn't need, in the end I chose to use two of the MidWest Life Stages Dog Crates - see image and link below. Each cage measures 24 x 18 x 21 inches. I drive a Subaru Forester, which is not a huge car, but with the back seats down, both cages fit fine with room to store suitcases and boxes and my computer. 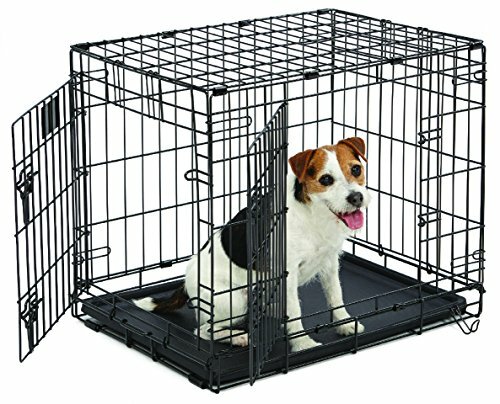 This MidWest LifeStages Cage for Dogs is What I Used for each cat - It Worked Great! I bought two 24 inch cages / crates, one for each of my cats. I added a "perch" in one cage - see photo below. The two nights we had to stay at hotels, my sons and I carried the cats, in the cages, into the room. These cages with cats, litter boxes and food bowls were heavy - one person alone could not do it! It took two of us to manage. It was the safest way to keep them from getting away, which was my biggest fear. My son was driving a U-Haul truck, and when we stopped for the night he helped with the cats. Skittle's cage had a second level to keep her from getting car sick - and it worked! My daughter's boyfriend, who is a carpenter, suggested a second level addition to one of the cages. He built a simple platform that rested on the bars to create an upper level for Skittle, the smaller cat. It gave her more area to use, and she could move around from top to bottom as she wanted. It turned out that she used it a lot, and she never got car-sick once during the three day long drive! The upper level gave her an outside view and that kept her happy. This was easier than I had thought, so it's perfectly fine to wait and get a hotel the day of your stay. I was a little worried about finding a good hotel that was pet-friendly, but there were plenty of them around to choose from. Each afternoon on the road I would look up the area on my cell phone. Then I would call to reserve a room for the night in whichever city / town we would be coming to along the highway. Some hotels charge an additional amount just for the pets, and some don't. In my case, I didn't know from day to day how far we'd get, so each day I called to book a room in the afternoon for that night. Weather can cause delays, and so can traffic. Once we had a pretty good idea of the time of arrival, I'd look on the map and find us a place. We stayed at LaQuinta the first night, and at The Hampton Inn the second. They offered very similar rooms, which were both nice. One difference between the two hotels was the much better, free hot breakfast offered at The Hampton Inn! It was the highlight of my trip. Breakfast never tasted so good after 2 days on the road. LaQuinta put us on the 3rd floor which was more difficult to get to, so I requested the first floor the second night. I had my two sons with me and they carried the cat cages, but they were heavy and cumbersome to manage on the elevator. Try to avoid that! Once inside the hotel room, I let the cats have their freedom, and did they ever appreciate it! A quick to view list of what I did, learned and would do again. Spend money on a comfortable cage / crate for your kitty. One that can be carried into the hotel room. Cats can escape from leashes, so don't do that... keep them enclosed until you are shut into your hotel room. Get tranquilizers from your veterinarian. I only used them the first day, but they helped calm the cats while they adjusted to long hours of riding. Hotels that accept pets were not hard to find, but they do have restrictions on number of animals and size. Ask the hotel to give you a first floor room! 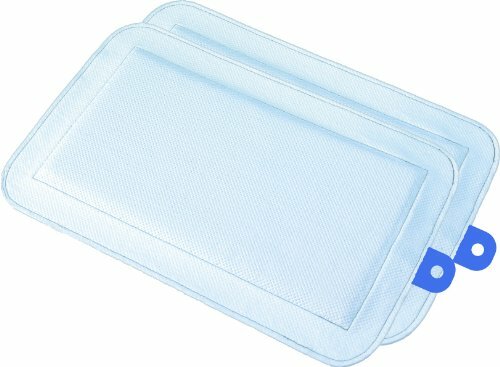 This one folds up to store it, and comes in a wide variety of colors. This foldable, travel littler box was the perfect side to fit in one side of the metal crate. I only added enough litter to cover the bottom so there would be less likelihood of spills. Both cats sometimes laid in the litter box while I drove. Once we finally arrived at our destination, I emptied the litter into a regular litter box and hosed out the fabric boxes. I used this as a litter box. 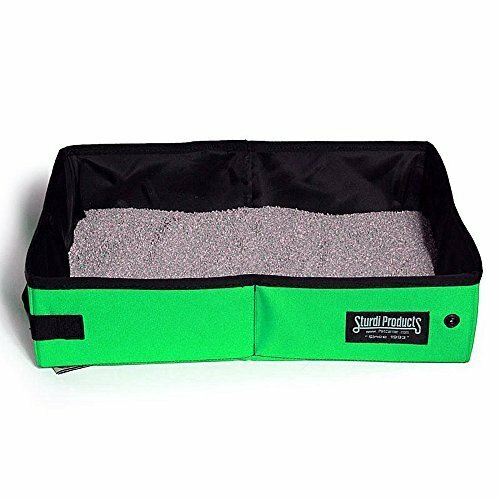 My cats ate and drank very little while we rode, so the litter box stayed pretty clean until we stopped at the hotel. Keeping the cat cage clean for all day travel. Each crate had an absorbent dry pad lining the bottom. The DryFur pads shown, which I used, don't completely cover the bottom of the crate, but they do the job fine. They absorbed any spilled water to keep the cat from sitting in a puddle. I left them in the cage for the three days it took us to arrive at our destination. Then I threw them away. 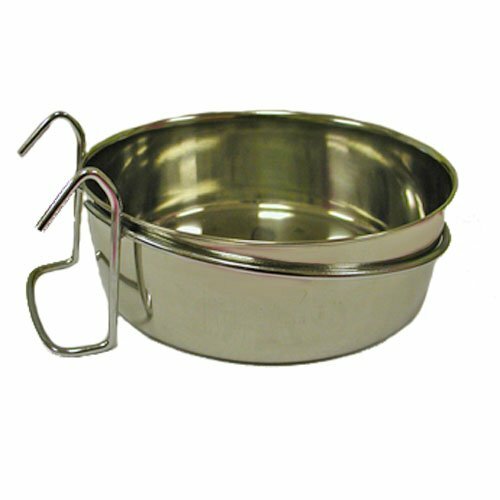 Food and water bowls were a big challenge for me. The bowls needed to be small enough to give the cats enough space to lie down without disturbing the dishes. I opted for this small hanging metal bowl for one cage and put dry food in it. I also used some small bowls from the house. My cats ate and drank very little whenever they were in the car. There was little spilling because most of our trip was highway driving. Each of the two nights we stopped at a hotel, I re-filled their bowls with clean water and fresh food. I let them out of the crates in the hotel room, but left the crate door open so they could use the litter box. In the morning I emptied the water before carrying the cats out to the car, and filled their water bowls, from a plastic water bottle, once they were "packed" in the back of the Subaru. The cat's name and my phone number is printed right on this custom collar. My cats don't ever wear collars. I worry that animals who go outside will accidentally get caught on something and get hurt or stuck. I also think that a collar must be a bit uncomfortable. But I wanted to be prepared in case the cats got away from me somehow. When ordering, I could choose the collar color, the text color and then add the cat's name and my phone number, which is embroidered right onto the fabric! Simple and ingenious! One complaint from customers who have bought the collar is that the text gets covered when it's tightened to fit the cat's neck. And some people said the collar was too loose for their cat. But 75% of 730 reviewers gave it 5 stars. 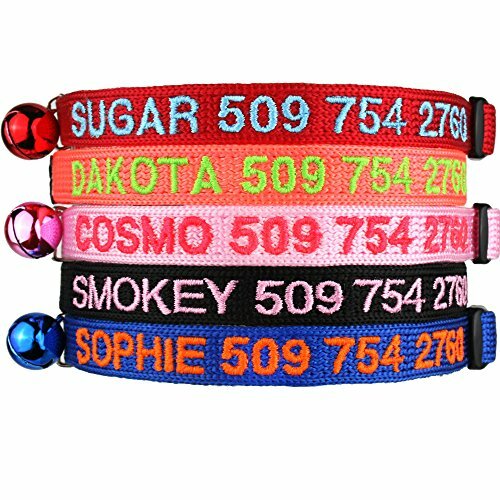 THESE ARE BREAK-AWAY COLLARS - so don't attach them to a leash. If the cat pulls on the leash, the collar will come apart and the cat will be gone! Plus you can choose your color combination. Back to the Beginning, It Was Trial and Error, and I have some products to return. Unfortunately, the good crates are advertised for dogs, so think outside the box for your cats. At first I thought about traveling with both cats in ONE CAGE. When I saw the Cat First, black and white checkered carrier pictured here, I thought - Great! Just what I need. I read the reviews and Most reviewers on Amazon gave it many stars and said it was great for transporting two cats. It is nice and big - 30 L x 20 W X 20 H. BUT, when it arrived (yes, I bought it) the reality was that this was not going to work for me. And anyone transporting two cats in it, either had small, quiet cats, or didn't include litter. There simply wasn't room. Also, a crazy, car-ride-hating cat (I have one of those) could tear up this fabric with her claws! Although this "cage" looks comfortable, the Cat First is not sturdy. It could not be carried to and from a hotel room with one cat inside, never mind two! It's large, but not practical. The Pop Open Cage For ... Two? This is one I DO NOT recommend. 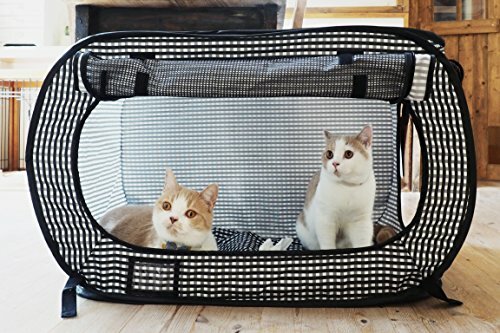 I'm including a picture and link here to this "Cat 1st Portable Pop Open Cat Cage" because it came up when I searched Amazon for a cat carrier. It seemed like a good idea at the time. It supposedly holds 2 cats - which is what I would be traveling with. So I bought it to see in person. It will be returned. It is large, but there is no way I would be able to keep two cats happy and comfortable in it for a trip of any length. If you have one calm cat, he or she may enjoy it, but the metal cage I used was more airy and sturdy. Any additional advice about traveling with cats?